We are proud to say that we are committed towards maintaining our high standard of excellence. CBSE has recently commenced an initiative of lauding and recognizing the best schools which have achieved an overall high standard of excellence by certifying them as ‘CBSE – New Generation Schools’. We are proud to have received this recognition from CBSE and are committed to maintain our high standard of excellence. We do not encourage any of our students to take tuitions or be overburdened after school hours as we believe that our in school academic systems and standards are very strong. We follow the CBSE Curriculum and enhance this by a multi-sensory approach and our unique research driven methodology. We believe that the bedrock of good academic performance is to have happy motivated children who from an early stage develop an enquiring mind to reason and analyse. We take great pride in our systems which have consistently produced the best academic results in Pune. •90% students passed with a minimum of 1st class. 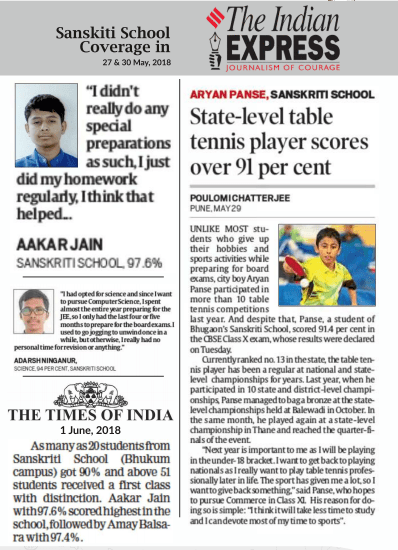 out of which 40% students scored 90% and above. 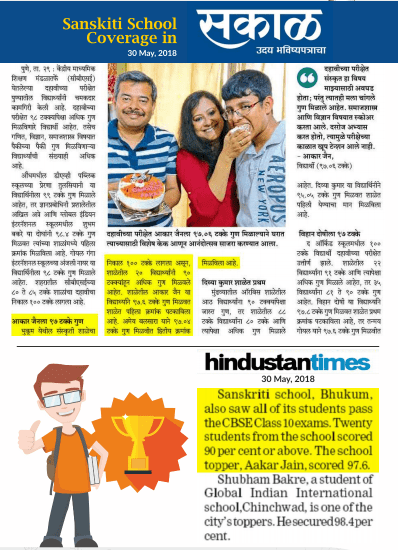 •90% students scored 70% and above, out of which 40% of them excelled with a score of 90% and above.